Make-up is fun and feminine, but it also clogs the pores of the skin, making it difficult for them to breathe, leading to skin irritation, breakouts and fine lines in the long run. The more we touch our skin and apply make-up, the more we are at risk of early wrinkles, especially on the delicate skin around the eyes. Less is more when it comes to applying make-up around the eyes, however the majority of us still don't follow that rule. 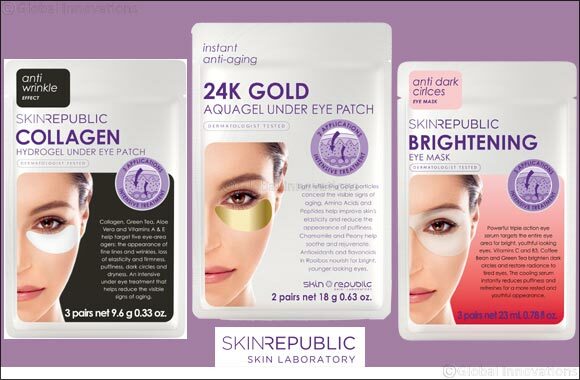 Sheet masks boost our skin with antioxidants and prevent water evaporation – providing smooth, hydrated skin and Skin Republic's collection of eye masks offer targeted therapy for brighter looking eyes. Light reflecting Gold particles conceal the signs of ageing. Collagen and Adenosine help improve the skin's elasticity and minimise the appearance of fine lines. Antioxidants and Phytonutrients found in Blueberries nourish for bright, younger looking eyes.